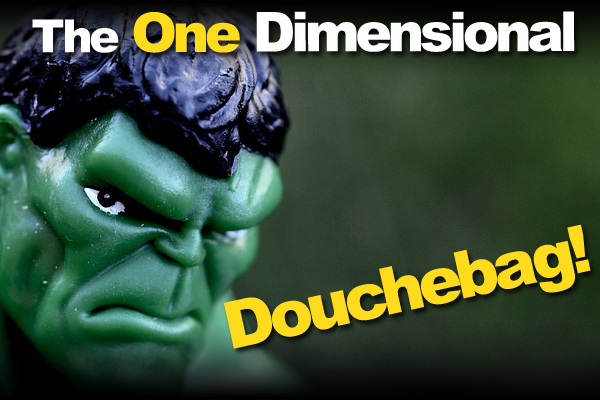 The one dimensional douchebag? Yep. The O.D.D.P. In the entrepreneurial world this is something that exists way more than we realize. In fact at some point it may effect you as well. In this podcast episode I go into what the one dimensional douchebag is, how entrepreneurs become one, what it does to them, and how to fix it. But I did something a little bit different for this one. I decided to test out some new software. I recorded this as a live video. And it’s not a typical live video from a cell phone. It’s actually a live video from my laptop computer. I added in some basic graphics, and Keynote slides. Which I haven’t really seen too many people do before. So below you’ll get that video, and the audio version as well. As for the topic of one dimensional db’s, it was an important one I thought should be discussed. But I didn’t know it. And so many others fall into this category as well. It’s just what happened to me and a lot of other entrepreneurs. So it’s important to talk about what this really is, and what it is doing to entrepreneurs. So below you’ll find the video, and audio versions of this. Do you have to be one to be successful? Is it only big entrepreneurs that have to deal with this? Now I know this may not be a normal topic to discuss. But very few things are on this site lol. There’s so much out there on biz growth, strategies, and that stuff, but not too much on the other side of things. Which in reality makes up for about 90% of your successful and happiness. Why not talk about being a one dimensional douchebag. And I was one for many years. Hopefully this helps you be more aware of what’s taking place.